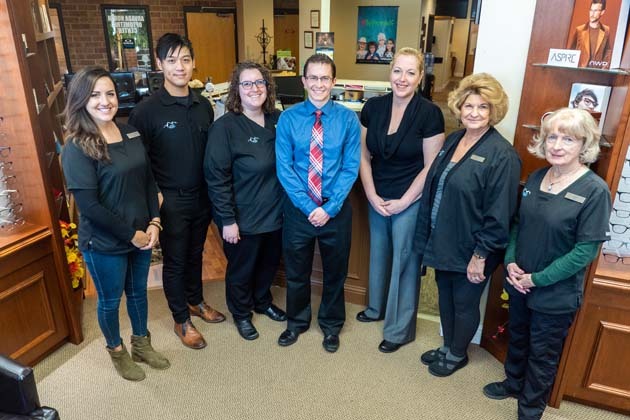 At Arvada Optometric Center, our staff is friendly and professional. Our commitment is to provide exceptional customer service to all of our Arvada patients. We take pride in our personalized care and strive to spend the necessary time with each patient to ensure a comfortable experience. Our Arvada optometry professionals are passionate about providing high-quality care to our family of patients. We focus on providing comprehensive eye exams, a large selection of fashionable eyewear, and the best possible vision care. Come in today to meet our Arvada staff and make an appointment. Marge Wilbanks has been with the practice since 1989. From the start, Marge has taken an active role in Eye Care. She was President of Colorado Paraoptometric Association for three years and was awarded Para of the year in 1998. Marge is our Billing and Insurance Specialist. Over her career, Marge has had the privilege of getting to know many wonderful families. Marge loves what she does and it shows, whether assisting patients with frame selection, teaching individuals how to wear contacts or answering questions. Barbara grew up in Massachusetts. She has worked in the optical field for 15 years and enjoys the combination of meeting and assisting patients and back office responsibilities. When not working she enjoys reading, outdoor activities and spending time with family. A Wyoming native, she is a graduate of University of Wyoming with a Bachelor’s degree in Biology. Brie has been at Arvada Optometric Center since 2012 and is currently a Certified Para Optometric. She loves helping people get the best vision possible and the look on patients’ faces when they realize there are individual leaves on trees. She enjoys using new equipment in the office and especially the edger, which gives us the option to make glasses in office. When not at work she loves to read and is often told by her niece and nephew that one day they will find her buried by her books. Stephanie has been with the practice since 2012. She has earned her CPO and is dedicated to giving the best patient care possible. In addition to her many duties in the office, she is training in specialty contact fitting and instructing patients in their care. These lenses are for conditions such as Keratoconus and post surgery. Stephanie wants to make sure that when you leave our office, you leave with confidence in your exam and a smile on your face. When not at work, she enjoys spending time with her son, traveling to the mountains for hiking and camping, and the occasional evening downtown with friends. Roger is the newest member to the AOC team. He has a passion for eyecare and learning all he can about the field. He is currently working on his CPO certification to build a broader knowledge base and to better understand the individual patients needs. What Roger values the most are the relationships he has built with his patients and looks forward to building many more. Outside of work Roger loves to play guitar, watch movies, and being a Colorado native, loves the outdoors.